Yesterday the I encountered the spirit of “Coach” Jerry Martin. But first, let’s back up. One Saturday during the summer after 9th grade in 1980, my mom and I went to Triangle Sporting Goods at Towson Plaza to buy something, who knows what. That’s when I first met Mr. Martin. He recognized my mom from high school, they went to Hereford together. They chatted, he mentioned teaching and coaching at Perry Hall high school and mom mentioned that I would be going there in the fall. Through my high school years (and after), although I didn’t run track or cross country, when I would see him he would always address me by name and ask how my parents were. Probably the last time I saw him was sometime in the early 1990s. When he passed away, I read his obituary and realized that not only did he and my mom know each other in high school but that they were distant cousins. I asked my mom if she knew they were cousins and she said, “oh, yea, that vaguely rings a bell” but she didn’t know exactly how they connected. I got out my tree and we talked about how they were related. Now to the present. Yesterday I attended a Baltimore County Genealogical Society meeting for the first time. It was also my first visit to their library. I was talking to the Assistant Librarian about what they had in the library and she asked if where I was searching. When I told her that most of the people I was searching on were from northern Baltimore County she said, “Well you are going to love it here”. She proceeded to show me several things that had been compiled by “a gentleman that had lots of information for all people he could find in northern Baltimore County”. Then she told me that after he passed away his wife donated much of his information to the society. She showed me the “Martin Files”, several boxes of cards files containing information on lots of folks. She also directed me to some binders organized by names and also by places. As she opened up one of the binders I saw the name “Gerald Martin”. I thought to my self, “I wonder if that is Jerry Martin?” Then she opened another and the first page had Jerry’s picture. She asked if I knew him and I told her that I knew him from high school and that I also knew we were distant cousins but I didn’t find that out until after he passed away. I took some time to browse the binders and it was amazing how many articles he had photocopied, organized and pasted into these binders. Then I went over to the Martin Files and started browsing there. That is when I got goosebumps. In the brief time I looked through the cards I didn’t necessarily find anything new (although I definitely need to go back and look more thoroughly) but under ‘B’ I found he had my parents’ marriage announcement, my grandparents’ obituaries and funeral cards. Then I flipped to ‘H’ to see what was there for Henry. I found my father’s obit, my grandfather’s obit and funeral card and several obits for my great aunts and uncles. It was amazing to see all that someplace other than in my home office (and much more organized than mine). I wish I had gotten into genealogy earlier so I could have talked to him about our family connection. I know that most who knew him in his capacity of teacher and coach had supreme love and respect for him. Now I also know another side and how much he has contributed to the genealogy community as well. I also wonder if he carried his genealogy stuff around the same way he did his grade book…tucked in the back of his shorts. HA!! Thank you Coach Martin, my cousin, I will be thinking of you and thanking you for many years to come I am sure! Last night about a dozen family members on my Dad’s side got together for dinner. 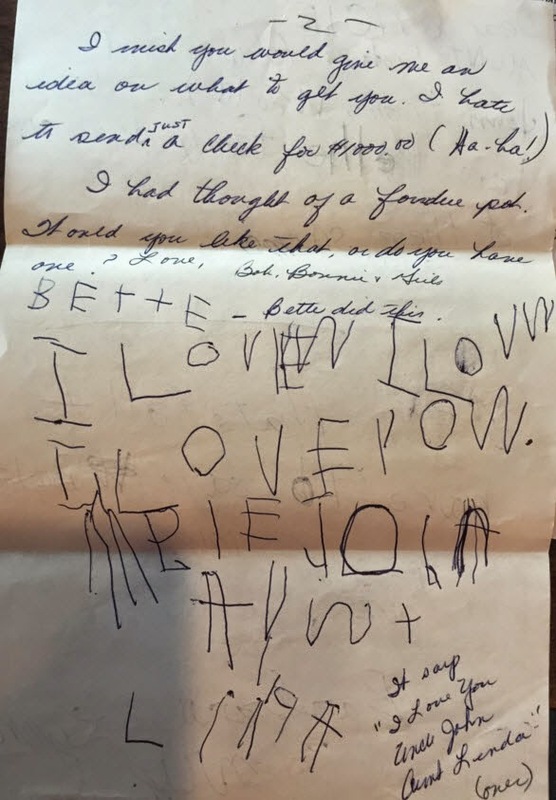 My Uncle John brought some old letters with him. These letters were written in the 1970s when he lived in Florida. It was so fun to read and pass around, especially since most of them were written by me and my cousins when we were kids. Letter writing, obviously, has declined due to the internet, email and Facebook. I didn’t realize how much I miss letters until we sat around that table and read letters last night. Yes, you can let your kids type emails, and you can print them out and pass them around the table too. But to see the handwriting it seems so much more personal. I hope he shares more letters in the future. I only took pictures of the 2 letters he brought that were written by me or my immediate family. 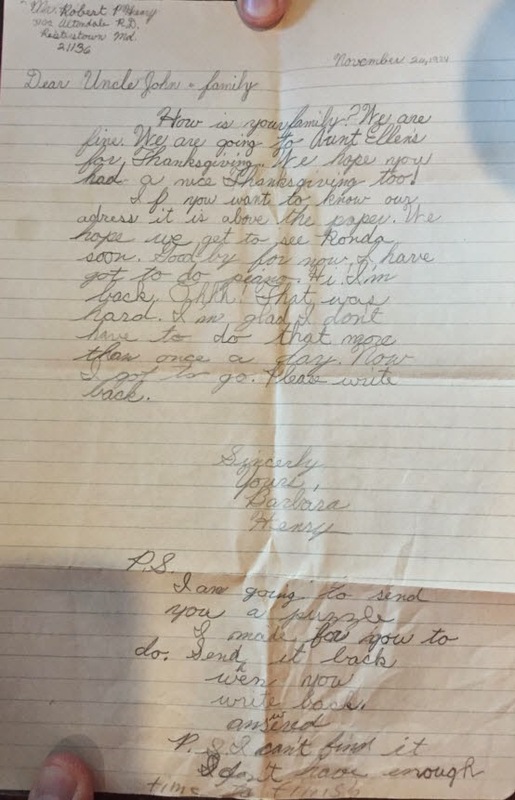 The first letter was written in November of 1972 by my mother. Also included were “snip-its” from my sister and I. You can tell it was the 1970s because my mother is inquiring if a fondue pot would be a good wedding gift for my uncle and his wife. First up is my sister, she was 5 and obviously just learning to write. On the next page, I put in my 2 cents. I was 7. I don’t have any return letters so I don’t know if he answered the question, I am sure he did. I do know that we did not go visit them in Florida as I am sure that it was cost prohibitive for a family of 4 supported by a surveyor. The next letter was written solo by me in November of 1974. Apparently my family only wrote letters in November. 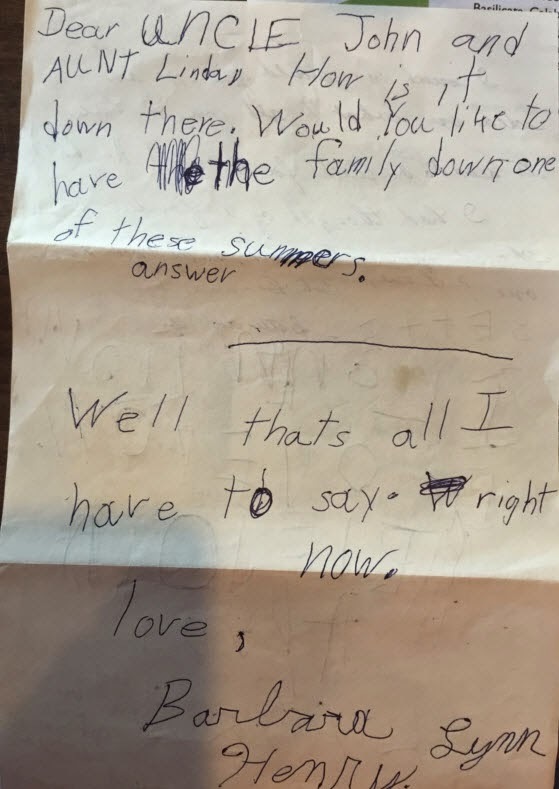 Judging by the address in the upper left and my formal closing, I assume it was written around the time we were learning letter writing in school. It seems silly to be overjoyed by these letters but it thrills me that my uncle saved them after all these years. It would be very easy to toss them away. I am so glad he didn’t.